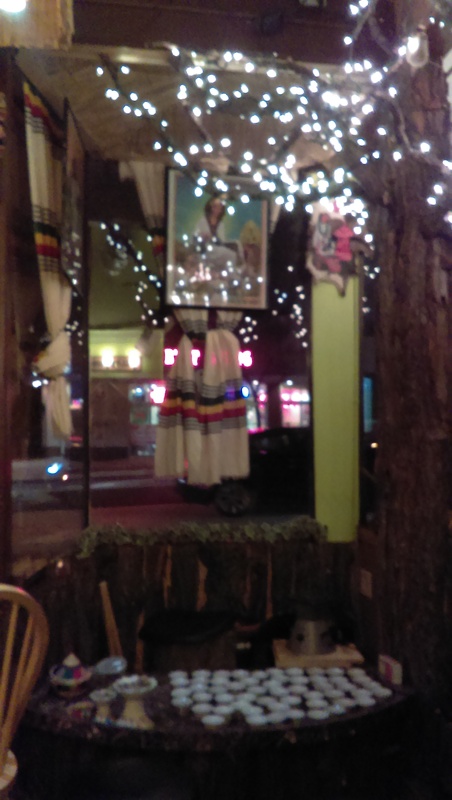 Cleveland has a new Ethiopian restaurant – Zoma just opened in Cleveland Heights in mid-December. It is open six days a week (closed on Mondays) as well as for lunch. I love Ethiopian, so I can imagine frequenting both Zoma and Empress Taytu. There is some overlap with Empress Taytu, but they are different enough that I can see them both happily coexisting. 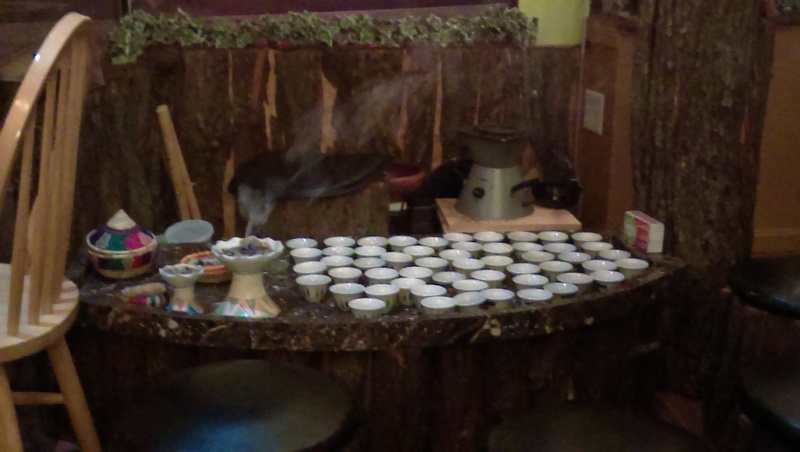 Zoma is located on the corner of Lee Road and Meadowbrook – across from Best Gyro. Parking is available behind Best Gyro and in a little parking lot at the corner of Lee and Meadowbrook as well as along Meadowbrook (free if you don’t mind walking a little bit). I gathered a group to eat there a few weeks after their Grand Opening. We were all very excited, so we had quite a nice group gather on a Wednesday night, despite the weather advisory and bitter cold. We took up half the place, and it was great to see the restaurant busy. All of the tables were filled for most of our visit, and several people came in for take-out as well. They have basket seating and tables. I reserved tables since it is easiest with a group, but basket seating is more communal and ideal for 2-4 people. 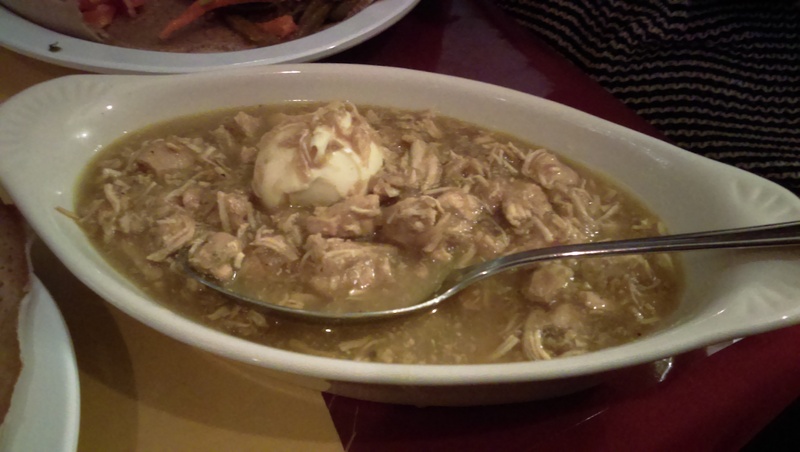 Ethiopian cuisine is characterized both by its unique flavors and its communal presentation, a family-style approach with multiple items arriving on a large platter. You eat by tearing off the injera with your right hand and scooping the food up to eat it, but they gave forks to several of my fellow diners who asked for them. They do not have a liquor license yet, but diners frequently stop at The Wine Spot across the street to buy some wine or beer to go with their meal. 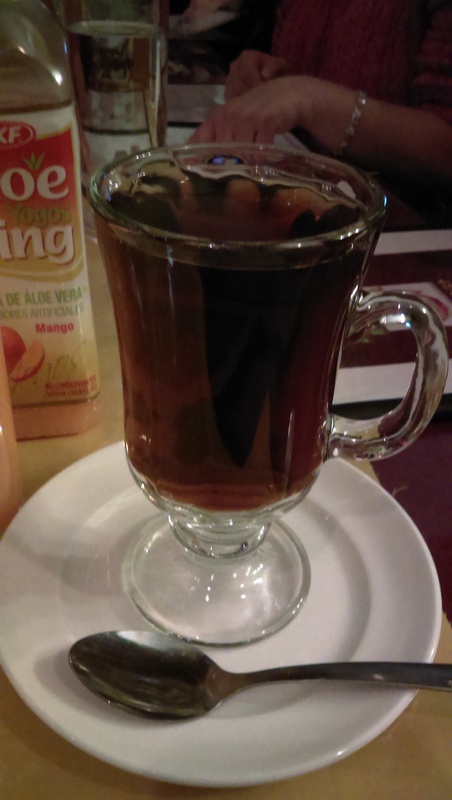 I ordered mango juice, which came in a bottle, and their tea. The tea was delicious, with cinnamon and several other spices. 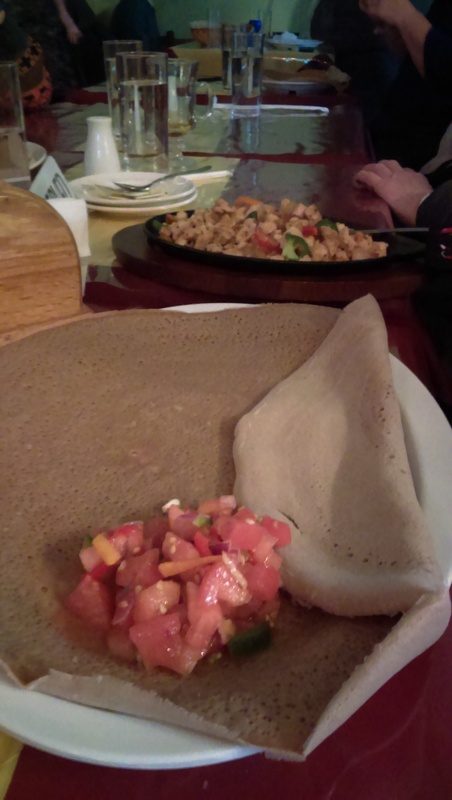 They offer two appetizers – the vegetarian sambusa and timatim fitfit, which has pieces of injera bread mixed chopped fresh tomato, onion, jalapeno, and Ethiopian herbs. Everyone who had the tomato salad as their sides loved it. No one ordered appetizers this time around. We managed to get our hands on the menu ahead of time, and the mild chicken stew ($14.99) caught my eye. It was absolutely delicious. The stew features chicken breast chunks simmered in mild turmeric sauce spiced with ginger, garlic, onion and herbal butter. It was absolutely scrumptious, and I can see myself ordering this a lot. I ordered the yellow split peas as my side and an extra side of cabbage for $2 or $2.50. I enjoyed the split peas, but really like the cabbage. It is made with potatoes sautéed with garlic, ginger and curry and was super tender. I love tikil gomen with carrots and tumeric, so this was close enough for me. That said, I will continue to go to Empress Taytu for my tikil gomen and mushroom and shrimp tibs fixes. About half of the group ordered some kind of tibs – either beef or chicken – and enjoyed them as well. One fellow diner ordered the spicy chicken stew, which was a lot darker than my mild chicken stew was. The tibs and stews came in hot little skillets and spoons to spoon the entree onto the injera. Tibs are my favorite, so I can’t wait to order it next time. The other diner ordered his go-to kitfo (ground beef seasoned with herbal butter, cardamom and mitmita served with homemade cottage cheese and cooked collard green/kale) and was very happy. 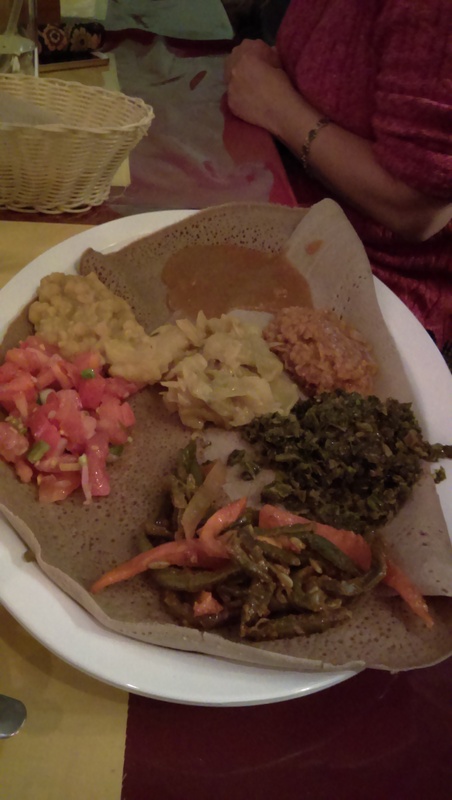 Many Ethiopian dishes are built around lentils, split peas, chick peas and greens, making them popular with vegetarians, and Zoma has a wide variety of vegetarian entrees. The other half of the group ordered vegetarian combo platters. The combo platters allows you to choose three of the vegetarian entrees for $15.99 and four for $16.99. One of my friends who wanted to try all six ordered the four-entree combo and two other sides. I got to taste several of them, and particularly enjoyed the collard greens and kale steamed with garlic, jalapeno pepper and traditional spices and the Fasolia Tibs, which are beans and carrots sautéed with garlic, ginger and tomato paste. I love that Zoma offers such a wide variety of choices. There are 11 meat entrees, six vegetarian entrees, one seafood dish, and endless combinations. 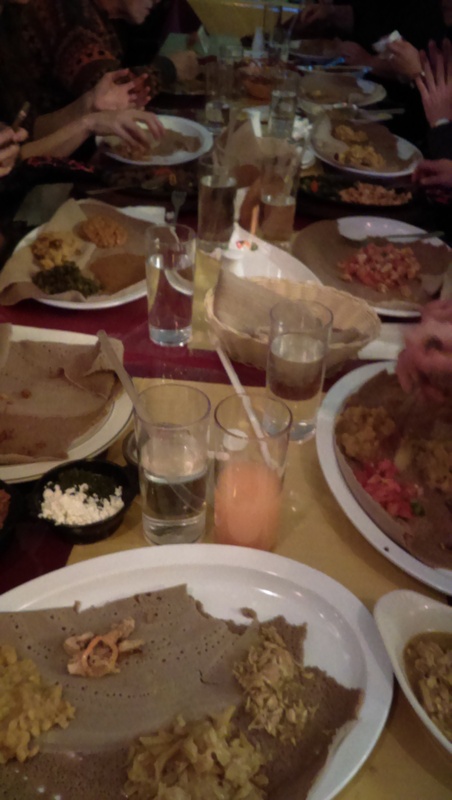 My friends who are well-versed in Ethiopian cuisine raved about the injera, saying it was the best they have ever had and they’ve eaten Ethiopian all over the place. It was absolutely delicious, with a fermented lemony flavor. They use a mixture of dark teff and barley flour. It added some nice flavor to the stews. Overall, I really liked it. I can see myself eating here a lot due to its proximity to my home (a 5-minute drive). 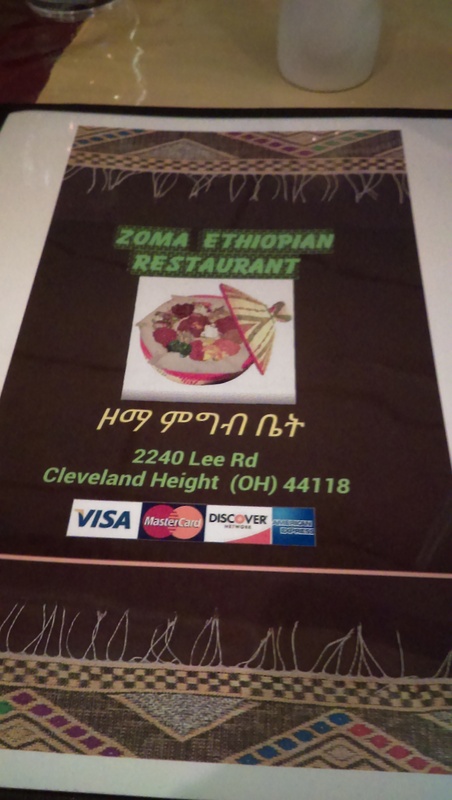 It’s nice to have a second option for Ethiopian here in Cleveland. They also offer their coffee service, but for now only on the weekend – although they did roast some beans for us for ambiance.